The Maggie & Moe Mysteries: Naptime for Murder! 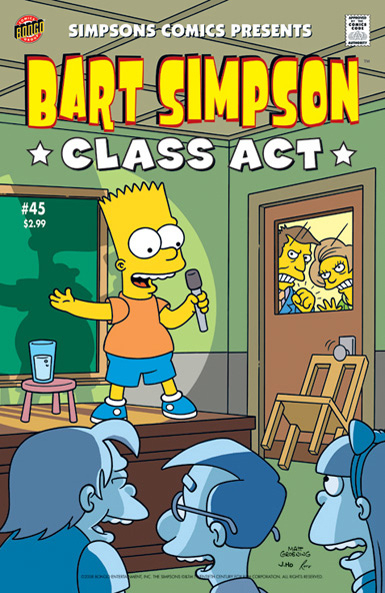 Bart Simpson Comics #45 was released in USA in December 2008. 1.2 Bart Simpson in: Dog Gone Hollywood! 1.4 The Maggie & Moe Mysteries! Tonight's Episode: Naptime for Murder! Bart Simpson in: Dog Gone Hollywood! Main article: Dog Gone Hollywood! The Maggie & Moe Mysteries! Tonight's Episode: Naptime for Murder! Main article: The Maggie & Moe Mysteries: Naptime for Murder!